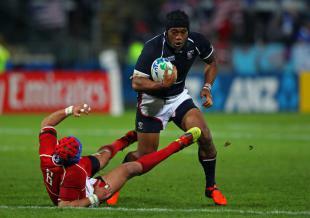 The United States scored five tries in a 41-23 victory over Canada at Twin Elm Park on Saturday in a Rugby World Cup tune-up for both teams. The Eagles put the contest out of reach with three late tries. Tries from Greg Peterson, Andrew Durutalo, Andrew Suniula, Mike Petri and Cameron Dolan helped the Eagles notch their third straight victory over their northern neighbours - who had tries from Taylor Paris, Nick Blevins and Aaron Carpenter but nevertheless dropped a seventh-straight match. "We let ourselves down with the little details," said Canada captain Carpenter. We put a lot of pressure on them inside their 22 but we couldn't get the job done today and left too many points out there." The United States, who are drawn along with South Africa, Scotland, Samoa and Japan in Pool B in the Rugby World Cup, have two more warm-up matches, taking on Premiership side Harlequins in Philadelphia on August 30 before facing Australia at Chicago's Soldier Field on September 5. Canada, drawn with France, Ireland, Italy and Romania in Pool D at the World Cup, will host Glasgow Warriors next Saturday.